BOSTON (WPVI) -- Al Horford and Terry Rozier scored 26 points apiece, and even Giannis Antetokounmpo tipped in a basket for the Celtics on Saturday night to help Boston beat Milwaukee 112-96 in Game 7 of their first-round series and eliminate the Bucks and the Greek Freak from the playoffs. Horford had eight rebounds, Rozier had nine assists and Jayson Tatum added 20 points for the Celtics, who rode the home-court advantage to win all four games in Boston and advance to the Eastern Conference semifinals for the second straight year. Khris Middleton scored 32, Eric Bledsoe had 23 and Antetokounmpo had 22 points and nine rebounds for the Bucks. Milwaukee has advanced from the first round of the playoffs just once since 1989, losing nine straight playoff series since Ray Allen, Glenn Robinson and Sam Cassell brought George Karl to the Eastern Conference finals in 2001. Tatum had nine points in the first, when the Celtics scored 15 straight points - including a tip-in by Antetokounmpo into the Boston hoop - and 20 of the last 22 to end the quarter with a 30-17 lead. Milwaukee scored 11 in a row at the beginning of the second to make it a two-point game, but Boston answered with nine in a row to make it 41-30. The Celtics led 50-42 at the half despite going 1-for-12 from 3-point range. Horford had 14 points and seven rebounds at the break, and Bledsoe had 12 points for the Bucks. Milwaukee cut the deficit to three points early in the third but Boston scored 11 of the last 15 points in the quarter. Bledsoe has been unpopular in Boston this series because of a trash-talking back-and-forth with Celtics point guard Terry Rozier. Rozier mistakenly referred to him as "Drew Bledsoe" - confusing him with the former New England Patriots quarterback - early in the series. Bucks: Have an 0-18 record in playoff series in which they've lost the first two games. They are 2-8 in Game 7s. ... Bledsoe picked up a technical foul in the first quarter after complaining about a foul call. ... C John Henson missed his fifth straight game with a sore back. 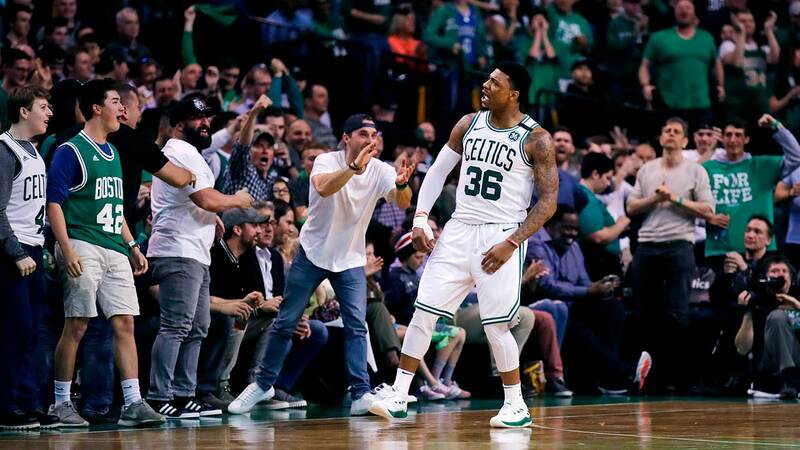 Celtics: Injured players Gordon Hayward, Kyrie Irving and Daniel Theis were all at the game. Theis, who has been out since March 11, recovered enough from left knee surgery to ditch his crutches for the first time on Friday. ... Also in the crowd: Red Sox owner John Henry and Patriots owner Robert Kraft. ... Red Sox manager Alex Cora and a bunch of players also filed into a pair of luxury suites after their game ended. ... Boston was 4-for-5 from 3-point range in the third. ... Rozier's 26 points were a career playoff high.